We have received very good reviews from the clients where we have installed this Panasonic Video Door Phone systems . In the Past 2 years , zero complaints have been received when installed by the authorised professionals . Avoid grey market duplicates by buuying from reputed companies or firms . This device will be installed at security cabin for visitors to communicate with residents through video intercom. An intercom system allows communication via a microphone and loud speaker between multiple rooms. Integration of the intercom to the telephone, or of the video door entry system to the television set, allowing the residents to view the door camera automatically. 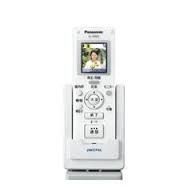 To retain our goodwill in customer consideration, we are offering an excellent range of Video Intercom. All these products are easy to use and clean and do not need much maintenance. Our products are technically accurate and offer hassle-free performance with accurate results. We ensure timely delivery of our products. Main Monitor Dimensions Wxdxh: 4", 7"